Country of Origin: Cyprus and southern Turkey. INCI: Origanum majorana Leaf Oil. Common Names: Majorane, Symbol of happiness, Wild marjoram, French marjoram, etc. Scent: Sweet Pine and Citrus Flavors. Appearance: Yellowish to dark yellow. Pure Marjoram oil has a wide spectrum of calming and sedative effects on body and mind. Its hypotensive, sedative and vulnerary properties make marjoram essential oil indispensable in treatment of various diseases. It helps to cure headaches, sinusitis, colds, bronchitis, asthma, stress /insomnia, fatigue, and pain in muscles and joints. Marjoram oil also has the following properties; analgesic, antispasmodic, antiseptic, antiviral, bactericidal, expectorant and sedative. Pure Essential marjoram oil reduces pain and has no adverse side effects. Marjoram essential oil is able to relieve all types of spasms and relieve problems in respiratory tract, intestines and muscular spasms in limbs. When used topically, pure marjoram oil helps to cure convulsions, muscle pulls, and cramps. Marjoram essential oil provides fast and long-lasting calming effects for headaches and migraine pain. Natural marjoram oil is widely used in curing virus infections and ailments associated with them, such as common cold, influenza, mumps, and measles. 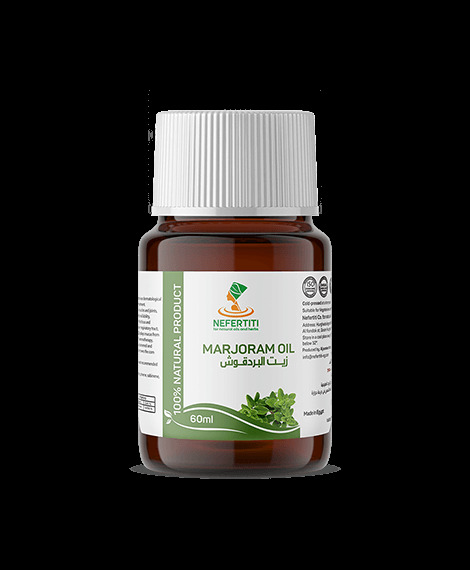 Marjoram essential oil is effective in relieve of cough, phlegm and congestion of nasal tract, larynx, pharynx, bronchi and lungs, related to cold and viral infection. It also helps to ease breathing. Pure Marjoram oil perfectly cleanses the nasal mucus and inhibits the formation of new mucus in the respiratory tract. In aromatherapy, pure marjoram oil gives calming, relaxing and sedating effects on the mind and body. Used by cold or hot inhalations. It is applied to the nasal cavity and used in saunas, bath and aroma lamps. Marjoram Essential oil can help with reducing snoring, in a natural way. Pure marjoram oil has fungicidal and bactericidal uses and is recommended for use externally to clear warts and calluses, topically apply onto affected skin.